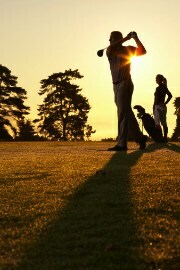 For golf lovers everywhere there’s just no better place to live than in a golf community. It has the potential of being the marriage of two perfect loves – a beautiful home and the sport you love most. You’re sure to find your perfectly situated home among our vast inventory of Ocean Ridge Plantation real estate and I’d be happy to show it to you. At Ocean Ride Plantation you’ll have the advantage of being able to play the following 5 different championship courses. Leopard’s Chase, designed by Tim Cate, has received stellar reviews and is ranked #10 by Golf Digest as the “Best New Public Golf Course in America,” placing the course at #1 in the Carolinas for 2007. In addition, it was also ranked #7 by Golf Magazine for “Best New Golf Course in America.” This par 72 course is as scenic as it is enjoyable to play. Tiger’s Eye is distinguished by dramatic elevation changes reminiscent of the North Carolina sandhills. Tiger’s Eye is a thinking person’s course requiring precision shotmaking and a reliable short game. This Big Cat was ranked amongGolf Digest’s “Top 100 Public Golf Courses in America” for 2007-2008. Panther’s Run is situated along the edge of a pristine nature preserve. Wide fairways twist and turn with a variety of elevations to continually test your abilities while using every club in your bag. With generous landing areas and large greens, Panther’s Runblends modern course architecture and a breathtaking natural setting for a seamless fusion of design and nature. Lion’s Paw has been described as golf designer Willard Byrd’s finest work. Part wild, part rustic and quiet, this magnificent course presents a lion’s share of adventure and breathtaking scenery. A 3 1/2 star rating by Golf Digest means this is a course you do not want to miss. The newly designed Jaguar’s Lair is a multi-million dollar renovation of the golf courses formally known as Angel’s Trace Golf Links. The best 18 of the 36 holes have been selected and are being redesigned, enhanced, and transformed into a world-class, award-winning golf course. This addition brings Ocean Ridge Golf Club to an incredible 90 holes of world-class golf. Take a look at the available Ocean Ridge Plantation real estate on our website. When you’re ready for an up close and personal look at any of the homes, just give Jayne Anderson a call at your convenience at 910 279 4001 or toll free 800 450-3684..